The old “deadpan” style makes the awfulness of the gags slightly more palatable than the self-satisfied smirking does. My esteemed colleague Epicus makes a good point. These Claude Barlow gags have been running for decades, long enough for Dinkle to transition from tip! tip! tap! typewriter to word processor to flatscreen display. Whatever humor could be derived from the earliest strips had to do with Dinkle’s serious demeanor as he churned out his lousy musical puns, because Act I Dinkle was such a humorless prick. Contrast this with the kinder, gentler Dinkle of today’s strip: so pleased is he with his latest groaner that I’m surprised he’s not leaning back in his chair, envisioning himself marching around a tiny baseball diamond. 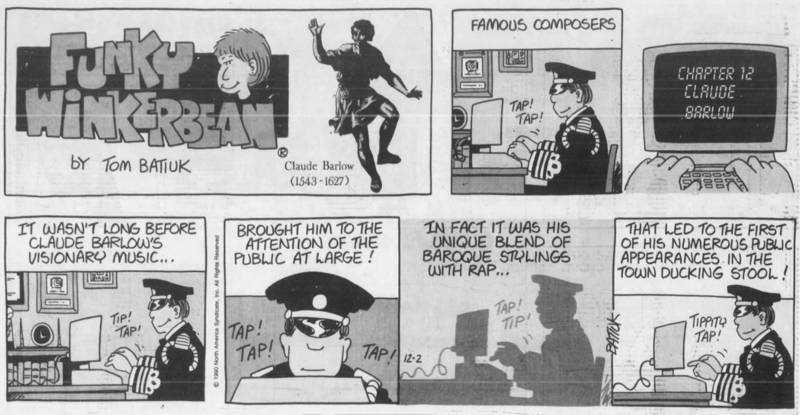 It should be pointed out, re: [Wednesday’s] vintage strip, that Claude Barlow died about 70 years before the piano was invented. And while we’re wasting our breath complaining about anachronisms in the Funkiverse: here’s a bonus strip in which we learn that Barlow toured with Franz Lizst (born 184 years after Barlow died) and appeared on a TV show even though TV didn’t exist! My previous comment about Steve Reich was more on the nose than I thought. I actually enjoy Reich’s work, but for works like “Music for 18 Musicians” it’s really Batiukian how Reich can take four or five musical phrases and repeat and adapt them over the course of the work to create something listenable. Batiuk, on the other hand, takes four or five terrible puns and repeats and adapts them over the course of several decades and creates something that isn’t listenable in any format at all. Thanks TFH. It doesn’t help the puns at all, but the deadpan humorless Dinkle is just far more palatable then the smirking self-satisfied Dinkle is. He’s totally enraging, yet astoundingly boring at the same time. You know, I don’t think anyone would pick apart the logical inconsistencies and continuity issues if Batiuk didn’t take himself so seriously, belittle his critics, or was occasionally funny. I have to allow the “his compositions weren’t played much as the piano was not invented until 70 years after his death” or “his appearances on Saturday Night Live weren’t such a big deal since the TV had yet to be invented” because goodness knows I use that joke structure myself. Fairly sure I could dig up some Robert Benchley example that does it better than any of us, too. I’m not asserting that you’re wrong if you’re not amused by these strips. I just say that the punchline isn’t by itself the problem. I think the difference is that Benchley (and Stephen Leacock) would drop bon mots like these in the midst of a longer humorous story, often a parody, to heighten the absurdity of the piece. Here they are occasional fillers that are stand-alone strips, disjointed from anything that precedes of follows it. That Benchley or another writer would point out the anachronism as part of building the bit helps, yes. The joke maybe would work better as the second panel, funny in itself but building to a bigger, loopier punchline about what was done in spite of the impossibility. You know, for as much as Batiuk idolizes comics as an exciting medium that can pair amazing visuals with an engaging story, you’d think he’d want to take more advantage of his opportunities. I can think of few lamer uses of comic space than “three panels of an unappealing-looking character typing silently with extremely weak puns at the top”. Dinosaur Comics has more amazing and varied visuals. It would also help matters if I didn’t fear that most of the reason he’s smirking is that he thinks that he himself is the right conductor. This means that Mort is about to be enlisted into a really bad take on Kraftwerk. I want one of those monitors. It looks like it dispenses coffee while you work. That would save me a lot of time. The two old comic strips shown here are actually amusing. Not only does he acknowledge the inconsistencies in his timeline, but he embraces them and manages to pull a couple of half decent jokes out of it. Quite a contrast with this week, which is just a reiteration of really tired old bad puns.